March 31 – Elkhan Mammadov is a different kind of ‘beast from the east’. Like many of the current crop of administrators taking leading positions at the top tables of world football, he comes without a history of old-school alliances. Relatively unknown outside his home country of Azerbaijan, he comes with a skillset that is in line with modern business practices and the new cadre of football administrators sweeping across the world game. Mammadov is one of 12 contenders for eight seats place on UEFA’s executive committee which will be elected at the European governing body’s congress next week in Helsinki, Finland. Aged 37 he is the youngest contender for a seat at UEFA’s top table where reform of age limits to 70 has already encouraged veteran Cypriot committee man Marios Lefkaritis drop out of the election. Azerbaijan is situated at the crossroads of Southwest Asia and Southeastern Europe. The Azerbaijan FA was formed as recently as 1992 and joined UEFA and FIFA in 1994. The country itself only regained independence from the former USSR in 1991. Since then its football journey has been fast-paced, with the last 10 years having been particularly rapid. Mammadov joined the Azerbaijan FA as general secretary in 2007 and focussed on building the FA both in terms of its internal capabilities and participation levels, and its external engagement on the world stage. “There was no proper structure, no youth leagues. We started to restructure and build relationships and bridges, it was a learning experience,” said Mammadov. “There were three areas to focus on. Grassroot, education (including teaching our players) and infrastructure of which we had a deficit. “Our first milestone was the FIFA U17 Womens’s world cup where we destroyed the stereotypes of women not playing football. After four years we hosted our first European Championships (UEFA U17 boys),” he continued. A young country, Azerbaijan has emerged as a strong local player politically due to its oil wealth. That money has provided the ability for Azerbaijan to showcase itself on the international sporting stage and the construction of facilities and infrastructure to be able to host major events. It has been a structured growth. “In our country we have had political instability, government politics, social problems – no priority was given to football. In 2004 we started the first phase. The second phase started in 2007. From 2017 have started a new five year cycle taking us through to 2021,” said Mammadov. “We now have proper stadiums for all our clubs – there are nine stadiums. The largest stadium has a 58,000 capacity and can host Europa League and Champions League finals,” said Mammadov. Azerbaijan’s capital Baku is one of the host venues for the EURO 2020 finals to be played across 13 venues – it has been awarded a group stage and quarter-final match. 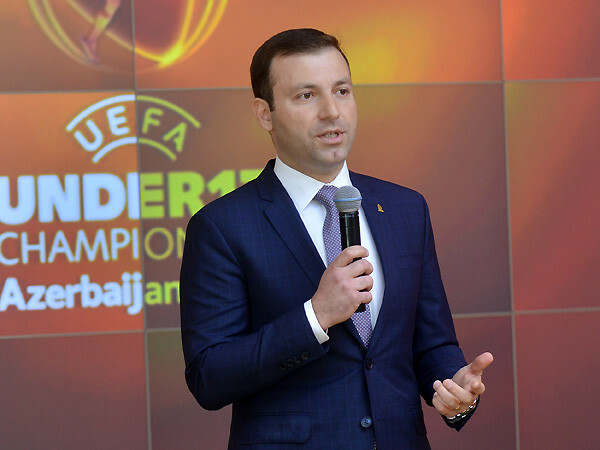 “ The is the biggest football event we could host as a small country with 10 million people,” said Mammadov, who brings a developing world realism to his thinking about football and its development. While his focus has been on developing his own FA – “we had to catch up with other associations. The history of our region is different to east and west Europe” – he is a student of the traditional football powerbases. He is also very aware of the frontline challenges for the smaller nations trying to compete both internationally but also in the provision of football opportunity in their countries. “The gap between the smaller nations and the developed nations is getting bigger and it is a fight to keep it smaller. The challenges and problems come from countries having different goals and completely different football structures. I think we need to help our developing countries with different strategies. We have created a big gap in the development of nations and we need to help close that,” he said. He believes that UEFA has a key role to play and while its money is essential for nations it can also help provide more in terms of helping with strategic programmes. He also believes that the solution is not to take the money away from haves and give it to the have-nots. “ The Big 5 leagues’ (wealth) was something achieved by them. What we must do in other leagues is to look to see what we can create for ourselves. It is not that we must pull them down, it is better to push us up,” he said. “We should have a strategy for each federation in terms of the leagues and how they can close these gaps. Cross-border competitions for some countries could be a solution. Mammadov worked in the financial investment authority in Azerbaijan for seven years before taking the job of general secretary at the Azerbaijan FA. As well as speaking his native Azeri, he also speaks English, Turkish and Russian. He is the only candidate bidding for a place on UEFA’s exco who speaks Russian. That might not be a deciding factor in his election but in a world confusingly split by east and west tensions and alliances (does anyone really know who is on whose side? ), he sits at an interesting crossroads – geographically and geo-politically.